Hornersville, Missouri (Pop 704) is located on the bank on Little River, three and a half miles north of the Arkansas line about midway between the St. Francis and the Mississippi Rivers in the heart of the Bootheel. It boasts of being the oldest town in the area, and between the years of 1800 and 1847 it was a lively trading post where the early settlers traded their beads and other trinkets to the Indians for furs. Hornersville was the scene of many skirmishes between the North and South during the Civil War. A number of the first farmers hauled their cotton by wagon to a point on the Mississippi River near East Prairie and spent the night with Chief Chilletucaus enroute. The old chief would spread his buffalo robes for the settlers to sleep on. Many stories such as this have been recorded in Douglas’ History of Southeast Missouri and in Mary Smythe Davis’ History of Dunklin County. One family that lived and worked in Hornersville in the early part of this century was the WICKER family. They had a son named Walter. Young Walter’s favorite place was his mother’s cafe on Main Street. Because of his pranks and mischievous behavior, he came to be known as Peck from the well-known “Pecks Bad Boy” hence he was lovingly known as Peck the rest of his life. Pecks mother, not only cooked for her business but for the sick, for church social gatherings, and other community events. This was the environment Peck grew up in, and it is obvious that he inherited much from his mother. He was always cooking for people. Early in 1940. Peck developed a sauce recipe for barbecuing meat. He would dig an open earthen pit for the fire, fasten wire over it to hold the meat, then baste it with his special sauce throughout the cooking process. He shared his culinary art with church and lodge groups. Everyone who tasted wanted more. From this beginning, he started filling gallon jugs with sauce. But people still wanted more. 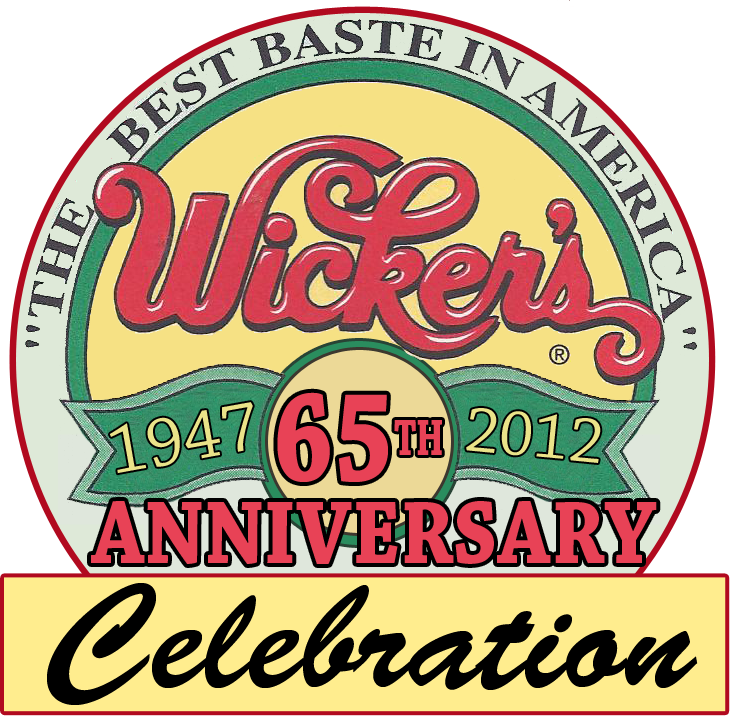 So, in 1947, he constructed a small building near his home, the first Wicker’s barbecue sauce manufacturing facility. He bought the vinegar in quart bottles by the case. The woman who worked with him would soak the bottles to remove the labels, then help Peck re-fill the bottles with his wonderful vinegar-base sauce. He sold the products locally and to visitors seeking his barbecued meat and/or the sauce. There was no effort to distribute the sauce beyond his immediate locale. Peck sold his delicious barbecue by the pound each year from a stand on Main Street during the Farmers and Merchants Watermelon Festival. Several of his satisfied customers urged him to also offer barbecued pork sandwiches and a new idea was born. Peck enclosed an area behind his little manufacturing facility. The sides were covered with screen wire and the ground was covered with sawdust for the floor. Thus, “The Pit” came to be a reality. He operated his business only on weekends from May through October and many a Hornersville youth helped tend the pit and serve the customers who came from miles around. Word-of-mouth was his only advertising. It was not unusual to see a long waiting line on Saturday night and Sunday after Church. Sunday night almost became Blytheville Air Base Night. When the word got around, there was a sea of uniforms of all ranks in Hornersville. A high point was a visit by Craig Claiborne, who was then the restaurant reviewer for The New York Times. For years, Peck would pull out his wallet and carefully unfold a yellowed scrap of newspaper. “This is what The New York Times wrote about Wicker’s,” he’d say, beaming with pride. Now you can experience this sensational marinade. Wicker’s is available in supermarkets, grocerys, specialty stores and right here at our “online catalog”. Thanks again for stopping by and please check back often to see our seasonal specials.